Now that the holidays are in full swing, you are probably packing your schedule with holiday travels, holiday gift shopping ventures, volunteer opportunities to help those in need, and, of course, all the holiday work and social events. But are you making enough time for yourself? While the holidays are a magical time spent with friends and family, they can become, well, quite chaotic. Even when we try to keep the stress and anxiety that often comes with holidays at bay, it can sometimes be too much to bear. 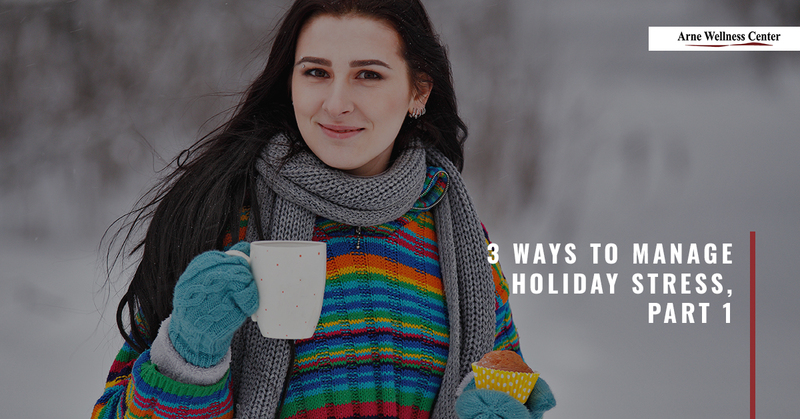 That’s why the massage therapists at Arne Wellness Center in Littleton will share three tips with you to help you manage stress and relax this holiday by practicing these healthy habits. One way to alleviate physical, emotional, and mental stress is to schedule regular massages year-round, but especially during the holidays when stress and anxiety levels can reach new heights. Give us a call to arrange an appointment for a therapeutic massage to relieve tension, pain, and stress. During the holiday season, we tend to focus all our energy and attention on others, which is great. But it’s easy to lose sight of your own health and wellness when you’re focusing so much on others. Give yourself at least 30 minutes of “you time” each day. Use this time to practice meditation, to close your eyes and enjoy an album, to catch up on a good book, or to just sit in stillness and set intentions. Giving yourself time in a day can be very therapeutic and rejuvenating. Deep breathing can give you a chance to decompress after a long, stressful day of work, shopping, or taking care of chores around the house. Simply put on some comfy clothes, sit in a quiet area, close your eyes, and focus on your breath. Inhale slowly through your nose, filling your lungs completely, and then slowly exhale through your mouth. Imagine yourself in a peaceful, serene location, which can help you further relax. Practice deep breathing techniques daily to manage stress. There’s nothing like taking a brisk afternoon or evening walk in Colorado. The sunsets here are nearly always picturesque and the stillness on a chilly fall or winter night can be incredibly soothing. Make time for 20-45 minute daily walks to help manage stress. Walking can also help you feel better overall by improving your posture, supporting a healthy spine, and helping to manage a healthy weight. Wellness care, whether in the form of massage treatments, chiropractic adjustments, acupuncture, and other treatments, can help reduce physical and mental stress. At Arne Wellness Center, we offer a variety of massage therapy techniques that integrate physical, mental, and emotional wellness. Whether you want to find pain relief or alleviate tension in your neck, shoulders, and back, your massage therapist can help you heal, rejuvenate, and feel better. Along with massage therapy, we offer a number of treatments that can help you manage stress during the holidays and year-round. Reach out to our Top Rated Local® wellness center in Littleton to arrange a massage or any of our other therapeutic treatments.